Thank you very much for the excellent course I passed and I wouldn’t without you. I passed and I definitely recommend your service. I passed the FE exam. The Testmasters FE prep course was a great help. It was well worth it. I will begin to save for the PE Prep course. I PASSED!!! Thank you for all your help and the fantastic class you put together. I graduated from college 19 years ago and I know I would not have passed my EIT without your class. I would have been lost without the course. I just received the result for the FE/ EIT exam I took last April and I passed. 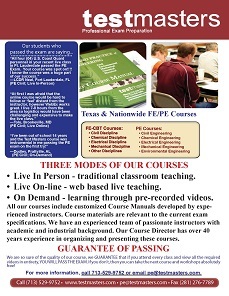 I will definitely recommend future FE/ EIT Exam takers to sign up for Test Masters. I’m planning to take the PE Exam this fall and will also sign up for the Test Masters PE Review class. I was one of the students that took the FE Training in Ft. Lauderdale (FL) for the first time, in preparation to take my FE Exam on April 2013 (for the first time), and Thank God and Test Masters. I PASSED. Honestly, I’m almost sure that if I didn’t take the training I wouldn’t have passed. I passed the EIT thanks to your excellent review course!! After 26 years!!! I passed!!! The course was VERY relevant for what I needed to prepare for this test. I have been out of school since 1986 and the detailed problem solving and verbal advice given by the instructors was very helpful for me. Thank you so much. I PASSED the FE after almost 15 years since graduation. I could have never done it without your class. It was spot on; I was surprised by nothing and was prepared by excellent strategies given in the class. I will definitely take the P.E. course. I passed the test, I scored 89!! All thanks to your classes’ help in preparing for the test, otherwise a person like me (a chemistry major in college, being a chemist most my professional life, and out of school for over 20 years) would have had no way passing the test. Many of the Materials and Mechanical related topics covered in the classes were brand new concepts to me. Passed the FE Exam after attempting the exam…before coming to take your course, and thanks to your Test Masters Prep Course I passed this time. It clearly made all the difference in the World!! Thank you again!! Passed the FE on the first try! Thank you all and I’ll definitely be taking the PE class next year. I really couldn’t have done it without Test Masters. The classes were all relevant…these classes were designed to help give me the best tricks so that I could practice on my speed and accuracy…The workshops were a must! !…I will definitely register for Test Masters when my PE comes around. I want to thank you and your staff for helping me pass the FE/EIT test on the first try. A big accomplishment considering the fact that I graduated 15 years ago! I took the Other Disciplines section and passed… Also, my degree is in electrical engineering and your course was the first time I saw most of the material. So, the course did an excellent job preparing me for the exam. I just wanted to say THANK YOU!… through your program I was able to learn the necessary items I needed in order to pass the FE/EIT exam in Alabama at the April 2012 exam. I plan to hopefully take the Mechanical PE in Oct 2012 in Alabama and would like to see about taking Test Masters Review Course for it. I will be advising all those that are struggling with the FE/EIT to take the Test Masters Course. Thank you again!! I just wanted to thank all of you for the amazing job you guys do in the classes, I received my FE result yesterday and I passed 🙂 Thanks!!!! I passed!!!!!!! Thank you Test Masters for the help. I don’t think I would have passed without taking this class. I have already recommended Test Masters to others and I will continue to do so! I passed… I’m a bachelor in Civil Engineering but decided to take the General Afternoon Exam since those were the subjects strongly covered with Test Masters. Thank You for all of your help and support, Test Masters taught me the quick and easy strategies that definitely helped me pass the exam. I have passed the FE exam!!! Thanks for all the good tips and teaching! I have passed EIT, and I have to admit this without Testmasters’ training, I would not have made it! I will be joining for your PE preparatory class. I passed the FE exam. I have to thank you for the excellent preparation course that you provided. I graduated about 14 years ago. The preparation course help me a lot to review my weakness topics and even learn to resolve problems that I have not seen before like in economics and thermodynamics. Thank you all. The preparation course was a considerable part of my success in the FE test. I PASSED the Fundamentals Exam!!! Thanks so much to the focused instruction from the Test Masters review course. I am thrilled and geared up to study for the PE now! I passed! Thank you very much! Your class helped tremendously! Thank you so much for all the training, classes and study materials you gave out during the FE class. I am over 4 years out of college but thanks to you, I passed the FE exam! I passed the FE! Your classes helped much and I recommended Test Masters to anyone any time. I will be seeing you soon for the PE classes. I passed the FE exam! Thank you for an outstanding review class. Keep up the good work. Thank you very much for the wonderful class…I really enjoyed your class and all the instructions, and clearly it gave me the edge to pass. I would recommend your program to anyone. I passed FE exam. Your calculator tricks and shortcuts turned out to be decisive in order to pass this specific FE exam. Just to be fair, I must say I would not have passed this exam without taking testmasters course it is amazing by all means. Thanks a bunch. I passed the FE on my first attempt. The class and study material along with all of the tips given during the class really made the difference. I passed! I graduated in 2005. Your course worked like a charm for the morning session! I passed!! Thanks a lot. Couldn’t have passed without the class!! Let me start by saying thank you for the class. It was definitely very helpful. Being out of school for almost 7 years was a bit difficult to get back into the routine of studying. Thank you very much for your review course, it was well worth the money and time. I am happy to report that I have passed the Virginia FE exam! You should also know that I graduated college with a science related degree…not engineering. The point being that if you can get a non-engineering major like myself to pass, you can get anyone to pass! Just wanted to let you guys know that I passed the FE exam. The review course did it for me. The strategy, tutoring, and support after the class helped immensely. Thanks for the excellent review course!! I couldn’t have done it without you guys. Just wanted to inform your staff that I have successfully completed the EIT exam! I want to say thanks for putting on such a great class and thank you for helping me pass. I just wanted to pass along the good news that I passed thanks to your program. The details that were covered, and short cuts that were touched on drastically helped out. I have taken the FE exam prior with unsuccessful results, but after your class I noticed a considerable increase in my ability to work and solve the problems efficiently. Thank you for your commitment to help out people like me. I passed the FE exam! I think the class was great! I really liked the teachers and it really helped me to focus on the areas that I needed to study. I completely recommend this course. I used to think it was very expensive and that is why I tried to study by myself and ended up failing all three times. I only wish I would have taken the class sooner! I was very happy with the content of the course and based on my result; I believe the course was effective and allowed me to be efficient with respect to the amount of time spent studying. The course materials and instructors provided me everything needed to prepare and pass the examination. Words can’t express the relief I feel to have gotten this behind me. I passed! I graduated 10 years ago and by taking this course got me over the hump! Thanks again!!!! Letting you know I passed the FE. Thank you all from Test Masters for all the help. I would not have passed without your review course. I graduated 8 years. I passed the FE/EIT!!! Your course was the only way I could have passed this test after being out college for 10 years. Without your class I would have had a hard time passing the FE. Your class was exactly what I needed to get re-acquainted with the material that I last looked at 5 years ago when I was a senior in college. I passed the exam on the first try and I owe a lot of that to your FE class. You will be pleased to know that I passed the FE in October 2010 after taking your course. I would like to thank you and your staff for helping me reach this mile stone. I thought all subjects and course directors were VERY good. I couldn’t have done it without your course. I am very glad to have taken your course. I especially liked the instructors focus on how the questions are asked. All of the instructors did an outstanding job in my mind. It is amazing to look back and think that I understand some concept in Thermo and Electrical circuits better now than I did in college. Your instructors are dedicated and willing to answer questions during breaks and even well after class review ended. There were two things that I needed to pass the FE/EIT…earplugs and Test Masters. I was very skeptical about taking the course and now I realize that I never would have passed the exam without you. You guaranteed a score increase and you delivered. Thank you, Thank you, Thank you. I received my FE results and I passed the test! The review course was very beneficial – and I did EXACTLY what you advised in your course, studied every week the suggested time, and used the materials provided in the course. I have other FE review books, but I did not study them at all. Your course provided just enough without being so overwhelming. I passed the FE!!! Could not have done it without Test Masters! I’ve been out of school for 7 years now, and without the help of your Phoenix team I wouldn’t have been able to do it. I just found out on Tuesday that I passed the FE exam! Just a little background info, this was the fourth time I’ve taken the test and the first time I’d taken the prep class. I was a graduate in Chemical Engineering and graduated in May 2005. So, as you can see I’d been out of school a little while. I have to give most of the credit for passing to your prep class. I think the instructors did a fabulous job; just enough info was given to understand and not get bogged down. I passed the FE!!!!!! Your class was great! Thank you so much and keep up the great work. The whole experience at Test Masters was excellent, and I credit the teachers for my passing. Although the classes were fast paced, I see no other way to cram so much information. Test Masters prepared me (without a doubt) for the EIT exam better than any other study process. What I like most about Test Masters was that it FORCED me to study all those hours that I was in classes (what was it, 90 hours?…). I never could have gotten that much study time on my own. The course workshop problems and mock exams were very valuable resources in preparing for this exam. This was an investment that was worth every penny. I have been out of college for 10 years. I passed!!!!!!! The first time I took the exam I studied a lot of material, but hardly anything I studied was on the test. The Test Masters course helped streamline my studying. Testmasters even taught me the main points on several subjects that I did not learn in college, such as Fluid Mechanics, Thermodynamics, Heat Transfer, Material Science, Mechanics of Materials. Thank you so much for the course. I did exactly what you told us to do and studied only the material you gave us. Thank you so much for your help. I most definitely could not have done it on my own. I find the FE review class really useful in passing the FE Exam. And I’m sincerely grateful for Test Masters for being part of this achievement. A big round of applause for all the students of Test Masters! The Test Masters course was excellent and I want to thank you all for that. I just checked my score and PASSED! Thank you very much for the class! I believe it was the key to helping my pass the EIT test. I thought the FE course was very well organized; teaching students how to answer the questions as quickly as possible and not waste time. Thank you again for helping me properly prepare to pass the FE! Your course provided me with the background and guidance that I needed to successfully prepare for the exam. In addition, I can affirm you, without any doubt in my mind; that this would not have been possible had I not taken the TestMasters course. I want to thank you and your staff of professors for their guidance and knowledge of the subjects imparted. Your class gave me the tools I needed to pass the test. This course was a tremendous help and I would recommend it to anyone. Thank you very much for your service. I checked the board website today and I PASSED the FE exam! I couldn’t have done without the expert and experienced instruction of your staff. I took the exam in 2006 with poor results and kind of gave up, but after re-evaluating my career goals I knew it was time to get serious which is why I turned to Test Masters. Couldn’t have done it without Test Master’s!!!!! Thank you so much! Will take Test Master’s for my P.E.! The test taking strategy given by Test Master’s worked…I paid very careful attention to units, read each question twice and eliminated 2 ridiculous answers and pretty much only had 50/50 left in most cases. You guys rock!! Thank you!! I passed the exam! The class helped me out tremendously! Thank you so much! I only studied the reference material you provided and worked the problems out of the workshop and the mock exams. I never bothered even looking at any outside references. This course definitely worked for me! I cleared the FE with score 91. It has been 18 years since my BS degree. The course at Test Masters helped me tremendously in my FE exam preparation. I passed! Thank you very much for all your help! This is what I needed to get over the hump. I passed. I’ve been out of school since 1982!!!!! This was my first time taking your review and it has proved worthy. I just want to say a big thank you to you and to Test Masters for all your help in preparing me for the EIT. I received my results today and I PASSED, YAAAAAAYYYYY. Thanks a million to Test Masters for helping me to prepare and pass this exam. I have told all my friends that Test Masters is the way to go. Your course was the reason I received this achievement. Thanks again TEST MASTERS!!!!!!!! Thankfully, I passed the EIT! I truly believe I could not have done it without the Test Masters review class. I passed the exam, and I know this happened because of Test Masters. The review was really straight to what the exam is all about, and I couldn’t have made it without TM. Thanks Test Masters for such a great review!!! It provided subject material in such a way that it was easy to grasp and remember when I actually took the test. I was happy with every penny spent for this course. Thank you all very much for your help! It was really worth it. I think your course was right for me and I will definitely recommend the course to any colleagues/friends of mine who require extra help. Thanks again! Thanks so much to Test Masters. I passed my EIT exam at the first sitting after leaving school for more than six years. The course taught me almost exactly everything I needed to know to pass the exam. I really appreciate your staff for providing a good material and tips throughout the courses. The Test Masters course was extremely helpful. I didn’t get the opportunity to study outside of class anywhere near as much as I would have liked, but the course gave good exposure to the type of questions that would be asked. Overall, a great class and I don’t think I would have passed without it. I’ve been out of college for 7 years and haven’t seen most of the topics covered since then. Thanks for all of your help. There was no way I would have passed the exam without the help of Test Masters. Your course provided passing results, thank you!!! I will definitely recommend Test Masters to anyone who plans on taking the FE. I am glad to tell you that I had PASS on my EIT. … It happened only and only because of Test Masters. Passed test, thanks for your help!!!!! Your class is worth every single penny. I found the study materials presented in your course to be instrumental in my success. I think the course presented the materials in an understandable manner and the instructors answered every question presented. I do believe the Test Masters course was the only reason why I was able to pass the exam. The course was fantastic! Thanks Test Masters! I’ll be seeing you guys when I need to study for the PE! I passed the test and really enjoyed your review course. I’ve been out of school for almost 5 years, and had I not taken your review course, I bet it would have been very difficult for me to pass the first time. You review course was very structured and helped me build my confidence that I can do it. Finally passed it! Thank you SO MUCH! I would have never been able to do this without Test Masters! I PASSED!! Thank you so much for all the help. The teachers were absolutely fantastic and pushed me to study and work harder than I would have ever done on my own. You honestly have no idea how appreciative I am for this class and the instructors. I wanted to thank you and your staff for the assistance you provided me preparing for the FE exam in North Carolina. I received my certificate in the mail this week and passed the FE exam on my first try. I passed! Thanks again for all the help. Well worth the time and money!! I’ve already recommended this course to my friends. I PASSED THE EXAM!!!!!!!! It was my first time taking it, and I know I definitely wouldn’t have passed had I not taken the prep course which helped tremendously with covering topics I, as an EE, had never had before (such as many of the mechanics/fluids/thermo stuff). … I hope Test Masters can continue to grow as a business and therefore offer more locations for students because passing these exams is definitely well worth the time and money invested by students. Thanks again for everything! I found the class to be extremely helpful. I took the FE exam for the first time in Virginia this past October. The Test Masters review course was great! It was a huge help, especially since I have been out of school for five years. I’m looking forward to taking your PE review course in a couple of years! Success finally! No way I could’ve done it without the class, and the calculator shortcuts / tips were especially useful. Thanks so much. I PASSED the EIT this past October 2009. The course with Test Masters is extremely well-oriented to this specific exam. I had taken other review courses in the past and Test Masters is by far the most accurate review. Thank you so much for your help. I passed. I believe your program is most certainly responsible for that. I received a passing score on the FE exam. Your course was very instrumental in me being able to pass this exam. I believe your course made an impact and helped me get through this important step. I wish I had taken the class before the April test, I think I would have passed it on the first attempt. I passed E.I.T. Thank you TEST MASTERS. Thank you so much for your assistance in getting me to the next step in my career. I will give you praise to everyone I know. I passed, yay!!! Thank you for everything!!! I believe it was your class that helped focus my studying at the important topics covered on the test. I have a degree in computer engineering and the best thing about the class was getting the knowledge on the other disciplines that I didn’t get in college. I would have never passed without your course. I passed the exam. I have been out of college for 9 years. Thank you again for your help preparing me for this exam! I wanted to thank you and your institution for the help provided. If it wasn’t for Test Masters, I wouldn’t have passed this exam. Being that this was my first time taking the exam, I do not think that I would have passed without the help of Test Masters. Thanks for everything!!! Thanks for all the guidance provided by you and all the instructors and staff from Test Masters. Thanks so much!!! The course was great! I passed, thank you Test Masters. Couldn’t have done without you guys. Thank you for the great review course! I passed my EIT exam! Your class made a difference! My opinion of the Test Masters course is it is priceless. I work full-time and I rarely had time to study on my own. However, I came to every class and workshop session, listened carefully and asked questions whenever necessary. I passed the FE and I’ll be back for the PE. Thank you so much for all your help. I only studied the notes that were given at Test Masters, and I recommend this course to anyone who is going to take FE /EIT exam. I think I had a solid morning section all because of Test Masters. Overall, I think you guys are the best!! I have been out of school for a while and could not pass the FE test. I finally decided to take your review class and it worked. Now I am moving on to the PE test. The classes and workshops helped me study every day and kept me focused. Without the course, I don’t think I would have passed. Thank you for everything, and I will attend your PE classes for sure. Graduated with my undergrad (E.E.) in 1987! Even after all this time away from the majority of that material, I was able to pass the test! Your review class helped a lot, particularly on 1) what to focus on in preparation for the test, 2) how to study, 3) the study materials you provided, and 4) the practice tests. It had been 23 years since I had seen most of the exam material, but I felt well-prepared and confident on exam day. All of the course instructors concentrated on the important subject matter and gave excellent advice on how to direct my study. I am so happy to tell you that I have passed the FE exam. I just checked the result 5 minutes ago; my hands are still shaking because I am too excited. I passed the October exam! 2nd time was the charm. I rocked the AM section and killed the PM section. This is the best Christmas gift I could have received! Thank you so very much for the class! I am so elated to have overcome this! I passed the FE exam, and I wanted to thank you very much for the excellent preparation course. After being out of school for 7 years and not really knowing what to study, I could not have passed this test on the first try without your help. Test Masters helped me in passing my FE exam which I took in October 2009. It helped me a lot in knowing what exactly I have to prepare for the exam and saved lot of time. I appreciate your classes for narrowing the type of problems to work and focus on. If I didn’t attend Test Masters classes, I would have tried to study a lot of stuff and perhaps I would have got frustrated as well as missed the real type of problems to study on. I just want to inform you that I had passed FE test and it was worth it to go to Dallas and attend the classes. Thank you for the Test Masters course. I think it was a major factor in me passing the FE exam on my first try. I passed the FE! Thanks again for the class. It would have been very difficult without taking the prep course. I did pass the EIT. As a professional who has been out of the classroom for over 25 years, this course was just what I needed. I couldn’t have passed without it. Thank you for providing this valuable service. I took the FE and passed. Your class really made a difference; I went to college over 25 years ago! I just would like to thank everyone for your help in passing. Working all problems again is what put me over the top. I passed! Thank you Test Masters! Couldn’t of passed without the course. I Passed the EIT Exam. The course was very beneficial. It taught you all the necessary information in order to pass the exam. I would recommend it to anyone who has been out of school for 5 years or more.